Yes, it has been raining every day since May 12, Valor damage (peanut) is everywhere, and growers need to apply POST treatments and cannot get in the field. What do I think? 1. Most areas in Georgia have received at least 4″ of rain or more since May 12 (Figure 1). This has resulted in many problems including Valor injury (no surprise) and/or the failure to get PRE herbicides applied. 2. Peanut growers who were planning on spraying Gramoxone + Storm/Basagran + Dual/Warrant/Zidua will very likely miss the ~33-38 DAP (28 DAC) labeled application window. If they miss that window, they need to pull the trigger on something else (#3 below). Cobra or Ultra Blazer + 2,4-DB + Dual/Warrant/Zidua (assuming ALS resistance is present). Check out Figure 3 for a recent picture of Ultra Blazer’s effectiveness on pigweed when applied correctly (rate, timing, GPA, nozzle, speed). I would expect the very same from Cobra. Some peanut growers have tank-mixed Cadre + Cobra/Ultra Blazer + 2,4-DB + Dual/Warrant/Zidua and have not had any major problems. But, I do not have a ton of data to support this 4-way mixture (1 test) but currently have another trial in the field right now to investigate. Hope to spray that this week. Avoid herbicide applications when soybeans are cracking. For whatever reason, soybeans tend to be more sensitive to injury from herbicides during this stage of growth and current environmental conditions (i.e. wet), including residual herbicides such as Valor, Prowl, and Zidua. My preference would be for POST herbicide applications in soybean to occur at the V1 stage (1 trifoliolate leaf) or later (Figure 4). Figure 4. 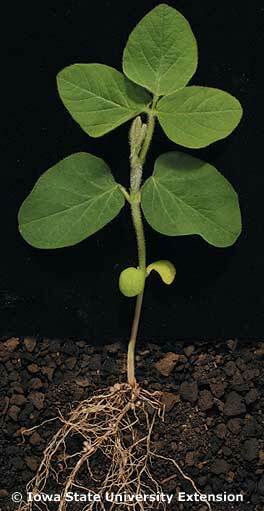 V1 soybean stage of growth. Source: Iowa State University.